October is Occupational Therapy Month- Let's Raise Awareness! OT Month 2017 was well celebrated at Queen’s University, with various events and activities organized by the Rehabilitation Therapy Student Society throughout October. 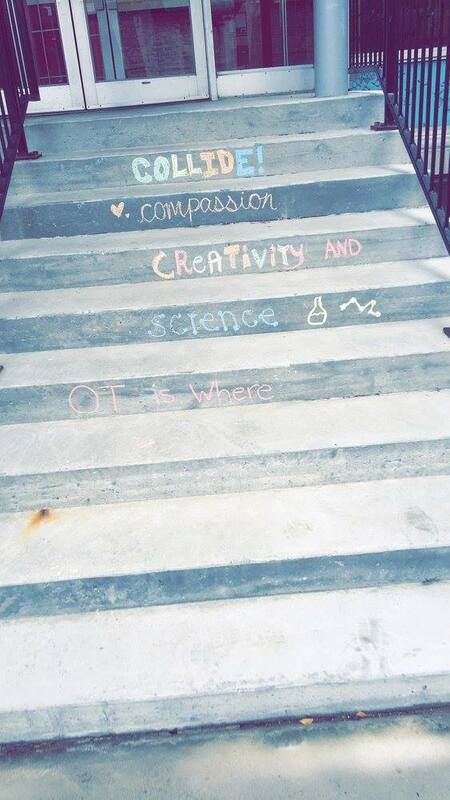 To kick off the month was OT Art Attack, a chalking campaign around campus to raise awareness about occupational therapy. An info booth was held on campus later in the month, to educate passersby about occupational therapy through interactive challenges and activities. OT month 2017 also included giving back to the Kingston community. Custom-designed OT t-shirts were sold to students and faculty to raise money for Jack.org, with a total of $100.00 being donated. A comedy night was also held at Absolute Comedy to raise money for Lunch by George. 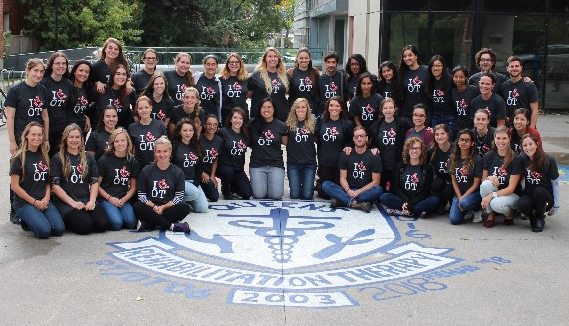 ​Check out these awesome initiatives to advocate about Occupational Therapy by the Queen's OT Students! #QueensOTmonth16 was used for students to share their OT Month Spirit. We also used #31dayOTchallenge from CAOT. The communications Officer was given a document with memes to share through the Rehab Society’s social media accounts. Purchased by 1st and 2nd Year OT Students– a photo of a group of both years by the crest was taken and sent to OSOT and CAOT. Portion of the proceeds to be donated to Jack.org (final totals TBA). Queen’s OT 2017 had a chalking event– chalk was dispersed to more of the class, plus Class of 2018 to do their own event. Organized by Queen’s OT Class 2017 with representation from Class of 2018. Amazing OT Month Video from the Queen's Class of 2016!